The following are announcements and notifications from Outpost 10F's senior staff, departmental groups, and command staff. Read this board on a regular basis to remain informed as to what's happening at Outpost 10F. Log into Outpost 10F's discussion forum to post announcements and messages of your own or to join in discussions of interest. PV chasing the chicks in Trelleborg [August 2002]. For the time being, OTF is operating under spoiler-free conditions. If you wish to discuss GoT, please open a temp room. Anyone CL6+ can do this. Hello, people of the Seven Kingdoms! Winter is here! Over the last few days we have been posting pictures on Twitter of Game of Thrones characters! 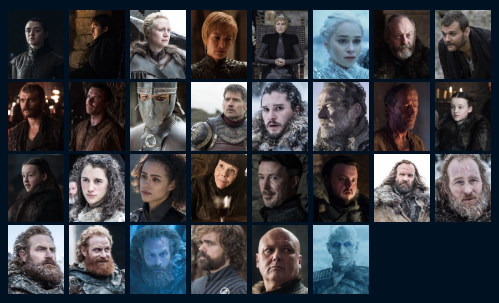 We wanted to let you all know that they are available as avatars in King's Landing! Below is the whole group of new avatars that were created for you to enjoy. So, enjoy! Also a note that the chat rooms are to be considered spoiler-free zones. If you want to talk about the latest episode, please open a temporary room, or ask someone CL6+ to open one for you. This is a zero tolerance policy. We want to give everyone a fair chance to enjoy the show without it being spoiled. This will be in effect for the duration of the show, plus an additional time (probably an additional two weeks, for eight weeks in total). We thank you for your understanding. Winter is here, and so are the new avatars! What is Brent may never die. A huge thank you to Carol for creating the avatars! The Blue Report! An update. The Blue Report is under new management! First and foremost, I want to thank Carol and Leslie for their hard work getting the Blue Report to where it is today, along with the many others who helped along the way. That said, for the time being, I (Brent) will be managing the Blue Report. I would ask that any submissions be sent to me (shadow_jedi@outpost10f.com) by the 25th of the month before publishing. I will be publishing every other month for the foreseeable future, starting in May. Please feel free to submit whatever you find interesting and relevant, so long as it’s PD friendly. Interesting Sci-Fi or Fantasy news, original submissions, video game reviews, movie reviews; whatever! Just have them in by the 25th of April for the May issue, otherwise I’ll hold it over for the July issue. Any questions, cash me ousside or send me an email. Our hearts go out to those impacted by the tragedy in New Zealand, and also to any outpost10f members who may have been affected by it. The following officer has been promoted for the month of January 2019. Your records have been updated accordingly. Congratulations and thanks for your contributions to Outpost 10F! If you have questions, comments, complaints and/or compliments about this month's promotions, you may send a polite inquiry to Katrina: katrina@outpost10f.com. And don't forget, anyone can recommend anyone! Please send those recommendation emails. Guess who's back, back again? Tell all your friends... We're back again! We're back with another issue of The Blue Report! It's a very exciting issue! Why? Oh because... *drum roll* The Blue Report has received a make-over! Yay! Thanks to a combined effort of Leslie/Wyvern, Mashed Potatoes, Katrina, Al, and myself The Blue Report is looking pretty spiffy right now! So at the very least go check that out. In this month's issue you will find articles written by Mashed Potatoes, Keith Is Brilliant, Mr. Numbahs, Sasha_J, The Bridge Crew, Nathalie, Leslie, and myself! With a variety of articles it is our hope that there is something there for everyone to read. And feel free to leave comments on the articles! We love it when you do! A big thank you to DARTHYOGI, one of our newer members, for taking the time to leave comments in the last issue! Without further ado! Go check out the March Issue of The Blue Report!! Over the next few days, the Outpost is celebrating couples. Not because Valentine's Day dictates we should, but because we want to. It really is just a coincidence that we are starting on that day, and you cannot prove otherwise! At various times, and based on when the chat attendance is high, be on the lookout for some of our Holodeck spectres, as they are likely to start posting images depicting couples from our favorite science fiction and fantasy series. After each picture is posted, you may attempt to identify the characters shown or to come up with a witty caption for the picture. Scoring will be similar to a Trivia event, where the first participant to correctly identify both characters will be awarded an RP, and the funniest captions will receive SPs. We hope you have fun and do not spam the Betazoid Gift Box too much and do not forget to shoot Greedo if he pops up, he seems to have broken free once again. The following officers have been promoted for the month of January 2019. Your records have been updated accordingly. Taters has been toiling away behind the scenes for The Blue Report for months. His work will soon be unveiled, but rest assured he's earned this laurel to rest upon. Leslie's work on the Blue Report has everyone she works with singing her accolades. Carol has been instrumental for a while now in keeping events going, and by all accounts deserves to be sung a little more. Sasha has burst onto the scene like a personable ray of light, and people have noticed! We're glad to have you, Sasha. We totally pulled a Britney Spears at The Blue Report and we did it again! Another issue is out and ready to be read. Oh baby, baby is it a good one! There's a little bit of something for everyone. This month's issue features all of our regular writers Jadzia, Mashed Potatoes, Leslie, Keith, and myself! Also featured in this issue is the return of the Bridge Crew article! And *drum roll* an article from one of OTF's newest members; Sasha_J! Woohoo! So stop playing games with my heart and go read The Blue Report!! After waiting an extra 15 minutes to allow more people to show up for the General Star Trek trivia things got underway. Our first real point went to returning member, Alice Ellen Hook. From there Keith took the reigns to show us that he knows everything about Star Trek while managing to not be nerdy. Along the way to crowning a trivia master there were spookyfish floating and laughter being shared! It was indeed like a Rhapsody sung by a Borg wearing green! Thank you everyone for coming out to play today! Your participation is valued. A special thank you to Professor Who for hosting and Professor Why for writing the questions. Ladies and lords! We are, once again, proud to present this month's issue of The Blue Report! You may now cheer with joy. In this issue you will find that we have a couple of special guest writers! Tyler 'Brent' Shadow and Keith is Brilliant have both written articles for The Blue Report! So be sure to keep an eye (or two eyes) out for their articles. This issue also includes several interesting articles from our regular writers. And of course the monthly Fandom News From The Web! So basically... If you're interested you can check out the newest issue of The Blue Report over here! Like a growing tree our little trivia for The Orville started out slow but grew in to a lovely event. Thank you to everyone who participated in planting that tree. Happy Arbor Day to you all! Nathalie also received a "Ya Nasty" point, Tyler 'Brent' Shadow earned himself the traditional "Spookyfish" point, and Mashed Potatoes gained himself a "Turtle" point. Thank you so much for coming out to play a little round of trivia you guys! Tyler 'Brent' Shadow and Nathalie your dossiers will be updated with your trivia wins shortly. And thank you to my lovely assistant Leslie for keeping track of the points! The following officers have been awarded for the months of November and December 2018. Your records have been updated accordingly. We hope you're having fantastic holidays and that the new year treats you all well! Congratulations and thanks for your contributions to Outpost 10F! If you have questions, comments, complaints and/or compliments about this month's awardsyou may send a polite inquiry to Katrina: katrina@outpost10f.com. The Grinch Has Been Stopped! Hurray!! 1st Place: Tyler 'Brent' Shadow with 36 points altogether. Click here for your award! 2nd Place: Hobbie/Ray with 16 points altogether. 3rd Place: Mashed Potatoes with 10 points. Congratulations guys! You rocked this game. And guess what? We've got some special awards to give too! Yay! For Mela, Click here for your award! For Goose, Click here for your award! For Keith, Click here for your award! For Michiel, Click here for your award! For Thor, Click here for your award! Thanks again for playing guys! I really appreciate it and hope that you all managed to have a little fun during this event. Also a HUGE thank you to Leslie for making the awards graphics; you rock! Do you like The Orville? Do you like collecting silly points? Do you like trivia events? Are you a Master of Goolge-fu? Did you answer yes to any of the questions above? Then you're in luck! I have exciting news for you! December 29th at 3pm est or 20:00 utc (chat time) there will be a trivia!! Yay!! For the television show The Orville to celebrate it's second season airring on December 30th! Yaaaay!! So bring your party hats, senses of humor, and we'll see you December 29th at 3pm est or 20:00 utc (chat time)! What a jolly issue of TBR! Read the newest issue of The Blue Report here! We're super proud to present the last issue of The Blue Report for 2018! Well done to our team and thank you to our readers. Please take a moment and give it a read if you haven't before. See you next year in our next issue! 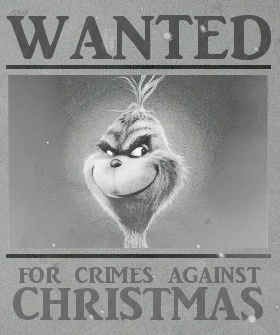 Stop The Grinch From Stealing Christmas! The Grinch will be appearing in the chat to steal our Christmas! He’ll appear once, twice, maybe thrice a day. Oh no; what can be done to stop him you say? Worry not for there is not only one or two ways but three ways you can help save Christmas; hurray! When The Grinch appears in chat there will be three ways you can collect a point. Please take note that there will be only one point given per person when The Grinch appears. So please don’t attempt to do all three ways to get all the points; let everyone have a chance. 1. Be the first person to shoot The Grinch out of the room. 2. Be the first person to order The Grinch a hot chocolate from the bar. Please be aware that even if The Grinch has been shot out you can still get the points for being the first person to order The Grinch a hot chocolate or yell Merry Christmas at him. But only if you're the first one to do either of those things. Remember though if you've already gotten a point for completing one action with The Grinch you cannot get any other points. Let everyone have a chance. Once midnight strikes in the chat on December 24th The Grinch will disappear with all of our presents unless we can stop him. So ready your armory, get the marshmallows for the hot chocolate, and prepare to give a Christmas cheer! Otherwise The Grinch will steal Christmas. The three winners will be announced on Dec 26th. Winners will receive a fun rank and award for their dossier! As some of you know... Christmas is coming. For some people that's exciting. For other people? Not so much. But over at The Blue Report? We're a little bit of both. And as a result we've got some questions for you guys regarding Christmas. Don't worry; we're not going to sneak through your window and leave you presents! 2. What is your favourite Christmas carol/song? 3. What is one Christmas tradition you must do? 4. Do you have a favourite Christmas memory? 5. If you could get a gift from any fandom (Star Trek, Star Wars, Harry Potter, and so on) what would you ask for? 1. How you celebrate the holidays? 2. Do you have any winter time traditions in general? 3. Do you still enjoy the Christmas carols regardless? 4. Do you still watch any Christmas movies? 5. If you were to gift during the holidays and it could be from any fandom (Star Trek, Star Wars, Harry Potter, and so on) what would you ask for? You don't have to answer all five questions. Just answer the ones you can/want to! And when you're done? Please send them on to Carol by November 30th. When you send in your answers please include your CL and Name! Just so we know who to credit in the article. Guess what time it is? That's right! It's time for The Blue Report! Yay! Leslie and I are once again proud to present another issue of The Blue Report. In this issue our wonderful team has brought you gaming articles, Star Trek articles, a dash of Star Wars, and more. We're certain there is something for everyone this issue. So put your feet up, relax, and give it a read. If you're ready? Check out the November issue of The Blue Report here! The October issue of the Blue Report is up and ready for your perusal! So hop on over and enjoy your read! Have a Spooktacular month everyone! The following officer has been (re) promoted for the month of September 2018. Your records have been updated accordingly. Congratulations and thanks for your contributions to Outpost 10F! If you have questions, comments, complaints and/or compliments about this month's promotions, you may send a polite inquiry to Katrina: katrina@outpost10f.com. And with the help of many chatters we had a champion of hilarity helping to keep the search for our Star Trek Alien Species Genius light and funny! Thanks for the laughs guys! A special thank you to Jessica for arranging this trivia and writing the questions/answers! Also a special thank you to Leslie for keeping track of the scores for me!